In this worksheet, students study the diagram to decide where different fruit and vegetables are grown. In this worksheet, you must read information from a Venn Diagram. 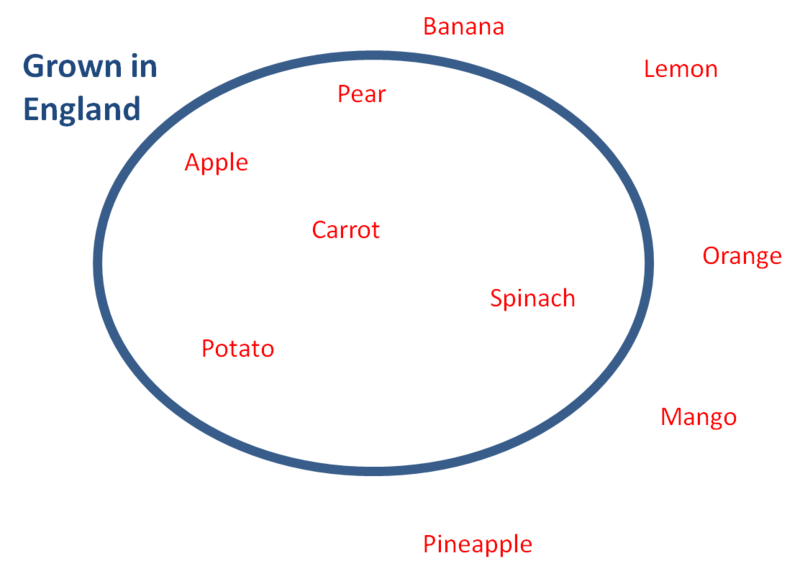 The Venn Diagram shows which fruit and vegetables are normally grown in England. The fruit and vegetables inside the oval shape are grown in England. The fruit and vegetables outside the oval shape are not normally grown in England. Look at the Venn Diagram to decide whether pears are normally grown in England. Look at the Venn Diagram to decide whether bananas are normally grown in England. Look at the Venn Diagram to decide whether apples are normally grown in England. Look at the Venn Diagram to decide whether carrots are normally grown in England. Look at the Venn Diagram to decide whether mangoes are normally grown in England. Look at the Venn Diagram to decide whether oranges are normally grown in England. Look at the Venn Diagram to decide whether spinach is normally grown in England. Look at the Venn Diagram to decide whether potatoes are normally grown in England. Look at the Venn Diagram to decide whether lemons are normally grown in England. Look at the Venn Diagram to decide whether pineapples are normally grown in England.